Bricklink and Brickowl list both these parts under the same item number. When importing orders from these sites, you may need to adjust your Rebrickable inventory for accuracy. This version has the same inclination angle as Slope 45° 2 x 1 (3040b) but is less than 1 brick tall. Read more in this article. 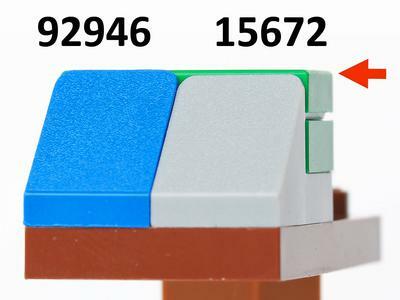 Click on a colored part below to see the Sets and MOCs that use part 15672 Slope 45° 2 x 1 with 2/3 Cutout [New Version] in that color. You can find an overview of all LEGO Colors here.